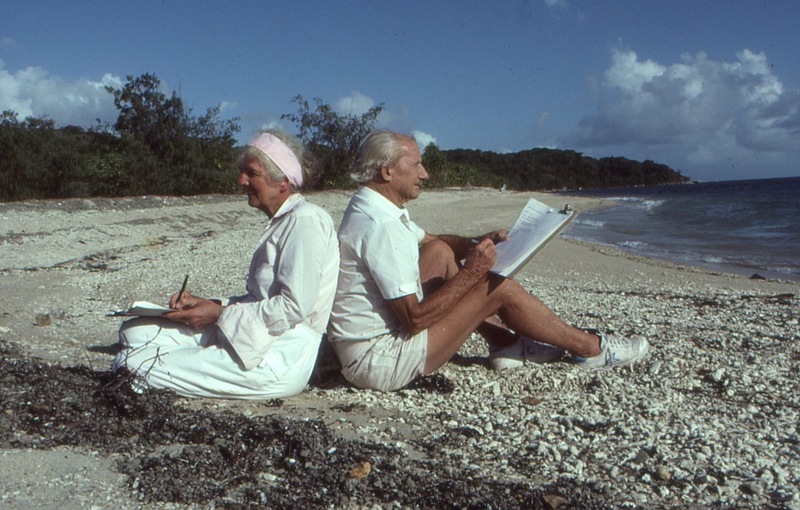 Arthur and Margaret on North Brook Island in the 1980s counting the Torres Strait pigeons. Photo courtesy and copyright of Cliff & Dawn Frith. Following the death of Arthur Thorsborne in 1991, Margaret established the Thorsborne Trust to commemorate and continue her husband’s conservation legacy. With Margaret’s recent death there is a renewed determination for the work of the Trust to continue in the name of both these two great champions of wildlife conservation. Over the past 27 years, under the guidance of Margaret as principal trustee, the Trust has initiated, supported and promoted a range of projects and activities in keeping with these aims. Dr John Winter, a close and trusted friend of the Thorsbornes, and a long-time collaborator on the the pigeon counts, has succeeded Margaret as principal trustee. The Trust gives meaningful financial support to research efforts benefiting the conservation of native species, notably the Torres Strait pigeon (Ducula spilorrhoa), southern cassowary (Casuarius casuarius) and mahogany glider (Petaurus gracilis), and their habitats. Other research supported by the Trust has featured the beach stone curlew (Esacus magnirostris), the rare blue banksia (B. plagiocarpa) and the corals of the Brook Islands, east of Hinchinbrook. A number of natural scientists conducting research and monitoring in the region also acknowledge ‘in kind’ support received from Margaret and the Trust. The Arthur Thorsborne Arboretum has transformed an area of degraded land at the entrance to the Edmund Kennedy National Park into mature, life-sustaining woodland featuring native species of particular importance to the Torres Strait pigeon and the cassowary. Timely intervention by the Trust prevented the loss, to private interests, of extremely high conservation value land on the shores of the Hinchinbrook Channel and enabled its protection as part of the Girramay National Park. The land is significant for both endangered plant and animal species. Local wetland and mangrove restoration and other tree-planting projects around the region have all benefited from Trust involvement and generosity. The Trust has consistently supported and participated in the annual monitoring of the Torres Strait pigeon breeding colony on North Brook Island. Observations from these surveys are essential in safeguarding the health and future of this important colony. Margaret Thorsborne herself attended almost every count until late 2014 and the new principal trustee, Dr John Winter, continues to play a key role, particularly in securing the future of this historically and environmentally significant project. Since 2015 the Trust has been making a major financial commitment to the project by funding two of the four survey trips each season. The Trust has supported local wildlife carers and carer organisations and has funded measures to protect wildlife locally and further afield including road alert signs, predator exclusion fencing and wildlife friendly fencing. Gift subscriptions to Wildlife Australia and numerous donations of books on natural history and conservation topics have been made over the years to libraries and schools in the region. Small gifts of money and materials have supported environmental projects at local primary schools. Over the years school and university students and Outward Bound participants all gained valuable experience and knowledge by working at the Arboretum. The Trust has submitted articles to community newsletters and to the Society’s magazine, Wildlife Australia and sponsored three successive North Queensland Conservation Council poetry competitions, designed to encourage environmental awareness especially among young people. In conjunction with the Queensland Department of Environment, the Trust created the extensive Torres Strait pigeon display for the Cardwell Information Centre and contributed generously to the production of the acclaimed documentary, The Coming of the White Birds (2015). Trust funds have assisted publication of key works on Australian butterflies and Melaleuca woodlands. In the Donate To box, click on the arrows to select Thorsborne Trust and proceed as prompted.